ScreenFloat - Make your Shots fly! 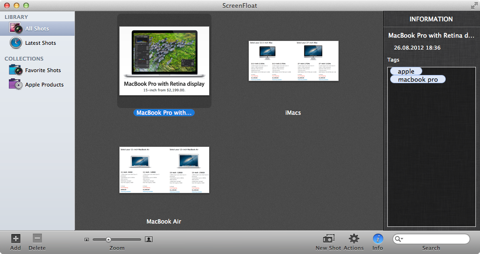 Use ScreenFloat to keep a reference of almost anything always visible, no matter what application or Space you’re in. Create a screenshot of the relevant portion of your screen with ScreenFloat and it will float above all windows. This way, you don’t have to move or resize windows around to keep information visible. With ScreenFloat’s Shots Browser, you can organize the screenshots you take in Categories and Smart Categories, give them a title and tag them. Double-click on a Shot in the Shots Browser to make it float again. Totally indispensable tool for OS X.
I love this app. Use it every day. Completely replaces OS X’s screenshot tool. It transformed my workflow overnight. doing real work on a Mac.